Fearless Squad. There are professions that are more human than the others. Being a doctor means your job is to take care of other people’s lives. Being a fireman means you are brave person who will enter crazy situations where fire happens and people are endangered. Only the bravest people will love to be part of a saving team after some disaster happens. It is the situation for today as well. We are inviting you to be part of a team of brave people who simply want to help others in pain and suffer. Roger and Irene are leaders of saving team that has a task to clean up the city after the horrifying windstorm that happened last night. This squad is fearless, has been through a lot of complicated situations and they have determined them successfully. Our player is part of this saving team and the mission can begin. For today’s mission, these brave men and women should find out if there is some citizen trapped in their home or maybe is hurt. You, our player is part of this saving team. So, don’t wait any longer, maybe someone is suffering and needs your help. Start your mission and be human person. And off course, don’t forget to have fun! 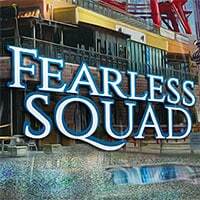 Fearless Squad is a free online hidden object game on Hidden4Fun.